Our recent appearances at the Sharing Good Vibrations conference included live performances of two tracks; you can now see Mission and Strange Town on our Youtube page. We’re very excited to be taking part in the marvellous Good Vibrations’ 10 year anniversary celebrations at the Southbank Centre with their 4-day ‘Sharing Good Vibrations’ event next week. Tickets are available from here and there are also bursaries and discounts available directly from Good Vibrations for those who would not otherwise be able to afford it. There are some fantastic sessions planned and some very interesting guest speakers – and us, of course! We’ll be making 2 appearances, on Thursday 17th at 4.15pm and on Sunday 20th at 11am. The sessions will offer the opportunity to get to know and understand the work of the Trust from the perspective of those who have experienced it first-hand. Former participants from all of our current programmes will join Artistic Director Sara Lee to share their stories and experiences and perform original tracks created for the occasion. This will be interspersed with three short films highlighting the work the organisation undertakes, both in custody and in the community. Following this there will be an open discussion with the chance to ask questions. We’re very proud to announce that on 12th September we were one of the recipients of a RSPH (Royal Society for Public Health) Award for our recent project at HMYOI Werrington, which resulted in the short-film ‘Highs and Lows’. If you haven’t seen ‘Highs and Lows’ yet, you can give it online here. It was a fantastic afternoon for the arts in criminal justice, as some of our wonderful colleagues in the sector were also recognised, including Practice Awards for the Koestler Trust, Dance United, Geese Theatre, and a special commendation for Music in Detention. The Arts Alliance Evidence Library was given a Research Award, as was the Musical Pathways project. This public recognition of the great value of the work we’re all doing, often hidden away in prisons, was very heartening. Head of Reducing Re-offending at HMYOI Werrington Joe Pattinson made the journey down to London to help us collect the award. A huge thank from all of us to the RSPH for this honour. More information about the RSPH Awards can be found here. We’re excited to introduce ‘Highs and Lows’ – a short film and soundtrack created by young men at HMYOI Werrington with the guidance of MiP, offering first-hand insight from the offending journey, into the realities of custody, and through the gate back into the community. The young people provide personal accounts of how their negative behaviour has impacted on themselves and others and how they have used this experience to make a positive change and look to the future. All the music and words were created by the young people. You can watch it in full here. Renowned violinist Tasmin Littleand pianist Martin Roscoe will perform a delightful programme including Mozart, Fauré, Ravel and César Franck, celebrating the transformative power of music in aid of the Irene Taylor Trust ‘Music in Prisons’. Since Lord Taylor of Gosforth founded the Trust in 1995, projects in the North East have remained at the heart of our work, so it’s fitting that this concert will take place at The Sage Gateshead in Newcastle. 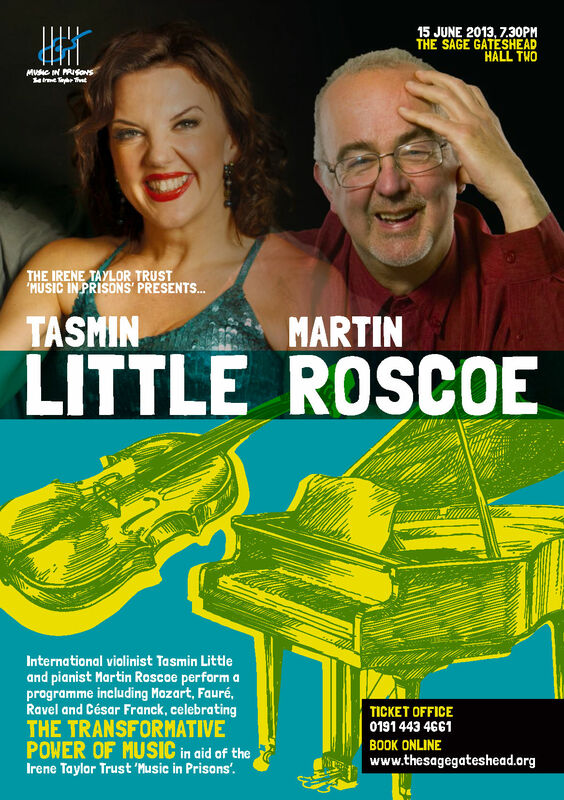 MiP is thrilled that Tasmin Little and Martin Roscoe have agreed to perform on its behalf. Please join us for an incredibly special evening to enjoy some stunning musicianship. The concert will take place on Saturday 15 June 2013, 7.30pm. Our second cohort of Making Tracks begins in February, giving young people in Lambeth the opportunity to discover their musical talent and develop enriching transferable skills. Participants from our Sounding Out programme will also join the project team to provide extra musical support and cultivate their own facilitation skills. A public performance on Friday 22nd February at 7pm will air the original songs written by the young people – why not come along and help us celebrate their achievements? Tickets are £10 – more details here. Sounding Out band perform at the Koestler Trust 2012 Exhibition Launch – Wednesday 19th September, 6.15pm – Clore Ballroom, Royal Festival Hall, Southbank Centre, London. Our Sounding Out band Platform 7 will perform as part of the marvellous Koestler Trust’s 50th anniversary celebrations and 2012 Awards Exhibition. The full event starts at 2.30pm, with a chance to see the fantastic exhibition of artworks produced by prisoners from 4pm. Platform 7 will play one track at the official ceremony opened by The Right Hon Kenneth Clarke QC MP, Lord Chancellor and Secretary of State for Justice; the wonderful Dance United will also perform. Platform 7 will later play a full set at 6.15pm. Tickets are free– well worth the bus fare for such a deluge of arts fun. On Sunday 15th there’s an MiP double-whammy at London’s Southbank Centre; at 11am you can see the film of our New Music 20×12 collaboration with composer Mark-Anthony Turnage ‘Beyond This’in the Purcell Room, followed by a panel discussion featuring Turnage and MiP’s Artistic Director Sara Lee; the event is free but requires a ticket which you can here. Straight afterwards at 12pm you can see our fantastic ex-prisoner bandPlatform 7 perform a set of stunning original material in the Queen Elizabeth Hall foyer. All twenty of the PRS Foundation for Music’s New Music 20×12 commissions will be showing at the Southbank Centre from Friday 13th – Sunday 15th, so why not make a weekend of it? Our Sounding Out programme (working with ex-prisoners we first met on our prison projects) has been profiled on the Guardian website in a wonderful piece by Tim Dowling; Dowling dropped in on two rehearsal sessions to get a full flavour of the creative process. You can read the full article here. 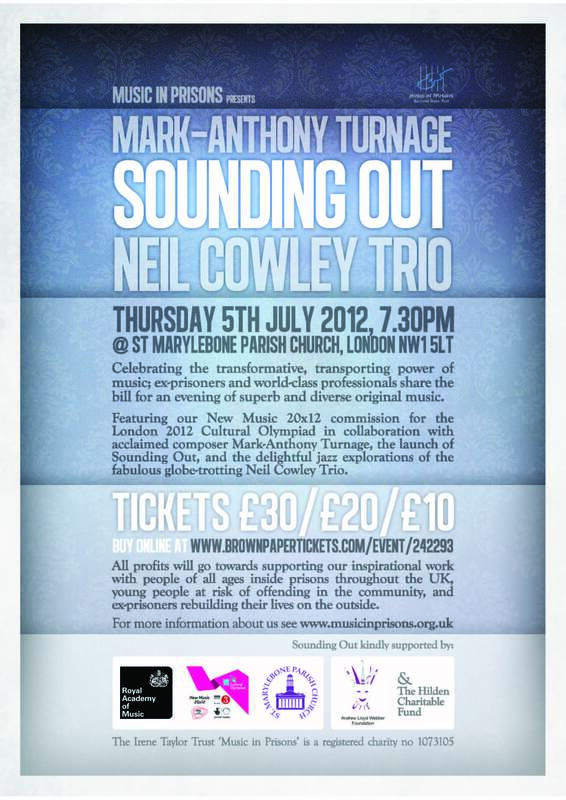 There are only a few days now until our very exciting evening at St Marylebone on Thursday 5th July featuring Mark-Anthony Turnage, the Sounding Out ex-prisoner band Platform 7, and a special set from the mighty Neil Cowley Trio. Doors open at 7pm – the nearest tube is Baker Street (a 4-minute walk) – St Marylebone Parish Church, London NW1 5LT. A CASH ONLY box office will be available in Church vestibule from 6.15pm on Thursday. This week sees the beginning of our new programme ‘Sounding Out’ for ex-prisoners. To celebrate, we’ve created a microsite dedicated to the programme, which will be updated all this week as the participants meet for the first time and begin the process of creating original new material as a band. You can find out much more about the programme here. Music in Prisons presents an evening celebrating the transformative, transporting power of music; ex-prisoners and world-class professionals share the bill, providing outstanding performances of original compositions. Join us on Thursday 5th July at St Marylebone Parish Church, London NW1 5LT. Our New Music 20×12 piece has had its first performance in HMP Lowdham Grange! What an amazing project it was. Working with Mark-Anthony Turnage was such a privilege and the 15 men who worked with us to create the piece were an inspiration. The piece will have at least 2 more performances (sadly not live but accompanied by a beautiful film created by Lizzie Coombes and Andy Wood) on Thursday July 5th at St Marylebone Church and on Sunday July 15th at London’s Southbank Centre. Music in Prisons is thrilled to announce the appointment of Karen Taylor as its new Director, Fundraising and Development. Karen brings a wealth of experience from her work with the London Arts and Health Forum and at the Arts Council and we are greatly looking forward to her joining our team. Karen will start in post on January 3rd 2012. Music in Prisons will be featured on BBC RADIO 2 on Monday 28th November at 10pm in a programme called ‘The Band Behind Bars’. It is an hour long documentary following the recent collaboration between Music in Prisons, Rideout and the Royal Philharmonic Orchestra at HMP The Mount. The Trust is sad to say goodbye to Victoria Samuel, who is moving on to pastures new. Victoria has been a great asset to the Trust and will be hugely missed. All at the Trust wish her well for the future and thank her for the excellent work produced during her time with us. It’s all change this week at Music in Prisons! Instead of working ‘inside’ we are delivering a community music project with young people in conjunction with Pathways SE11. If you live near to St Anselm’s Church, Kennington, SE11 then please come along at 7pm on Friday 19th August to support these young people and see and hear the results of their work. Mark-Anthony Turnage shares his thoughts about his new collaboration with Music in Prisons and HMP Lowdham Grange as part of New Music 20×12 here. Music in Prisons’ 15th Anniversary was celebrated on 4th April 2011 with a sensational performance by cellist Steven Isserlis and pianist Stephen Hough. With a programme featuring the works of Brahms, Bach, Busoni, Grieg and Liszt, the musicians wowed the 350 strong audience in the beautiful surroundings of Temple Church, London. Music in Prisons would like to thank both musicians for their participation and The Hanley Trust for its generous support of the event. Music in Prisons has been commissioned as part of PRS Foundation’s New Music 20×12 to write one of 20 pieces of new music for the London 2012 Cultural Olympiad! We will be working with our patron, the composer Mark-Anthony Turnage and a group of prisoners from HMP Lowdham Grange. This is a fantastic opportunity for the men to show how they too, can make a positive and unique contribution to the London 2012 Olympic celebrations. Music in Prisons would like to welcome four new additions to our valued team of Trustees. Peter Renshaw, Paul Spraggon, Peter Baldwin and Jonathan Adams have all agreed to join the charity and allow us to benefit from their considerable expertise in the fields of music and business. We are delighted to have them all on board. On September 28th and 29th 2010, as part of the Koestler Awards Exhibition and the Arts Alliance Conference, Music in Prisons will be taking part in discussions based on the undoubted, wide ranging and far reaching benefits of using music when working with people in criminal justice settings. Both events take place in the Southbank Centre’s Royal Festival Hall, London. Hooray! Victoria has arrived! Sara, Luke and all the Trustees are pleased to welcome Victoria Samuel to the Trust in the position of Director of Fundraising and PR. Music in Prisons is sad to bid farewell to Jo Tilley-Riley, Director, Strategy and Funding. Jo has worked dedicatedly for the Trust for four and a half years, helping it to grow and strengthen through her excellent work. Jo leaves the Trust with a solid, exciting legacy to build upon, and huge shoes for her successor to fill. All at the Trust wish her well for the future. Music in Prisons is delighted that the exhibition Inside Out, first shown at the Royal Festival Hall in collaboration with the Southbank Centre, has now moved north to the offices of Jordans Solicitors, Dewsbury. The exhibition features the brilliant photography of Lizzie Coombes – who accompanied the MiP project team to document the creative process of making original music with prisoners in HMP Holloway and HMP Wandsworth, as well as listening posts to allow visitors to enjoy the music composed on the projects. The Trust was deeply saddened to hear of the death of long-standing patron, Ian Wallace, this October. His inspiring friendship will be greatly missed. 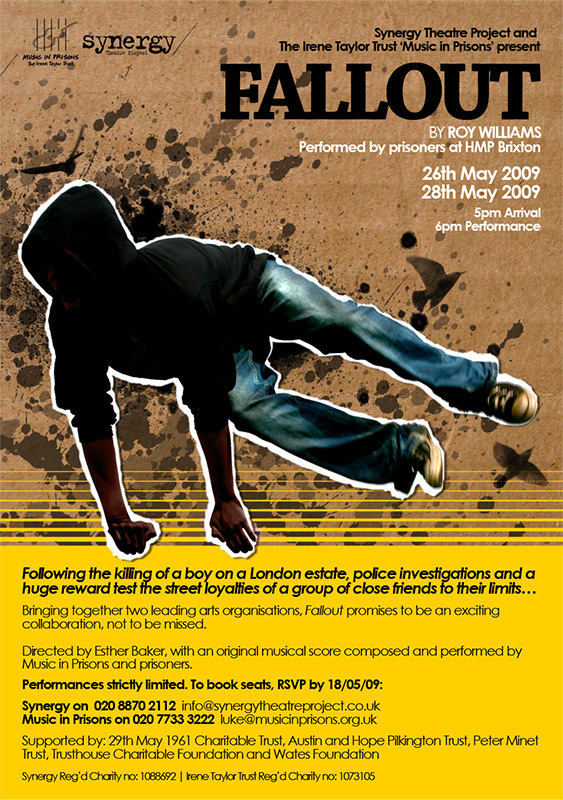 Music in Prisons collaborated with Synergy Theatre Project on a full-scale production of the play Fallout by Roy Williams at HMP Brixton. Music in Prisons worked with a group of inmates to create an original score to accompany the edgy urban drama. The play was performed 6 times to an audience totalling 568, comprising of other prisoners, prison staff, participants’ families and invited outside guests. The result was an exciting, relevant production that was inspiring for both participants and audiences. ‘Inside Out’ is a chance to witness the creativity and potential of men and women currently serving time in HMP Wandsworth and HMPYOI Holloway. Working alongside ex-offenders and the Southbank Centre’s Emerging Artists in Residence, Music in Prisons has brought together a powerful collection of music and images that tell the stories of rarely heard members of our community. Music in Prisons has been selected as one of the charities supported by collections at the BBC’s Proms Season. We are really excited about this opportunity to not only raise funds, but also widen awareness about our work. So if you are going to any of the Proms, look out for the collections! The Trust is delighted to welcome Her Honour Judge Deborah Taylor and Joanna Rich to the board of Trustees. Luke Bowyer also joins as Charity Administrator. The Music in Prisons team started the new year with two stonking projects at HMPs Whatton and Manchester. Both are forming part of the Men’s Evaluation project, which is already yielding interesting results. The Trustees have been engaging in a variety of activities, including retirement(Lilian Bennett is now official retired from the Board) and running marathons (well done to both Tim and Louis!). In December, Eileen Mascoll also took up her role as Advisor to the Board of Trustees. We hope she will bring her experience, commitment and musicality to the Trust’s work for many years to come. A new and exciting programme of creative music projects has begun, this time dealing exclusively within the adult male estate. What makes this programme different is that it is being externally evaluated by the Institute of Criminology, Cambridge. 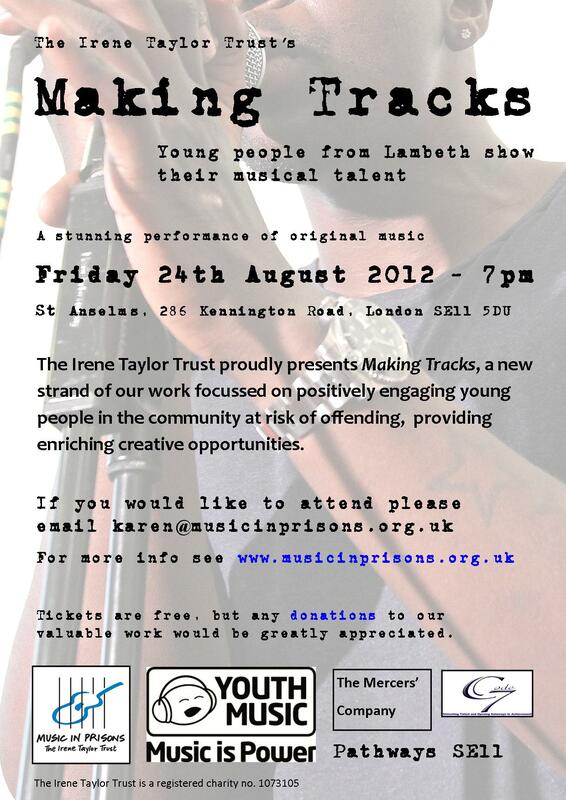 Once completed, the programme will give clear and objective proof of how valuable the work of Music in Prisons is. Hopefully, this will pave the way for greater recognition of the importance of arts in the rehabilitation of offenders. Music in Prisons is sad to announce the retirement of Lilian Bennett OBE from the board of trustees. Lilian has been a driving force for Music in Prisons from the moment she arrived. Her kind, personable manner and strong business acumen has inspired trustees and staff alike and we cannot thank her enough for all of her efforts over the years. We wish her all the best in what we hope will be a long and happy retirement. For the last 12 years, the Music in Prisons team has hired a van to transport our musical equipment to and from projects. In the past, this was the best way to minimise our costs as projects were only being delivered intermittently. But now the team are delivering two or three projects every month and we really need a van not only to free their time up for better uses, but also to reduce the costs of delivering each project. To buy a second-hand van would cost £10,000. We are almost halfway there and have raised £4,500 but now we need your help! Could you make a donation to help us do this? Or maybe put on a fundraising event for us? If you would like to help, please contact the office. Following two fantastic projects at HMP Frankland and HMPYOI Low Newton we are all eagerly awaiting the exhibition of photography and music from the projects which is being put together by the wonderful Lizzie Coombes into an installation at The Sage Gateshead. The exhibition will be open to the public from 23rd July to 4th August, so if you are in the Newcastle area please go along and see it! The Music in Prisons songbook and CD ‘A Picture of Me’ which was written with vulnerable women at HMPYOI Holloway has been short listed for the Royal Philharmonic Society’s Education Award. We are really thrilled that the women’s hard and talented work has received recognition at this level.